An argument that turned violent in downtown San Diego’s Gaslamp Quarter and left one man hospitalized and another in police custody apparently erupted over claims of stolen military valor on the eve of Veterans Day. Photo via OnScene.TV. An argument that turned violent in downtown San Diego’s Gaslamp Quarter and left one man hospitalized and another in police custody apparently erupted over claims of stolen military valor on the eve of Veterans Day, it was reported Friday. 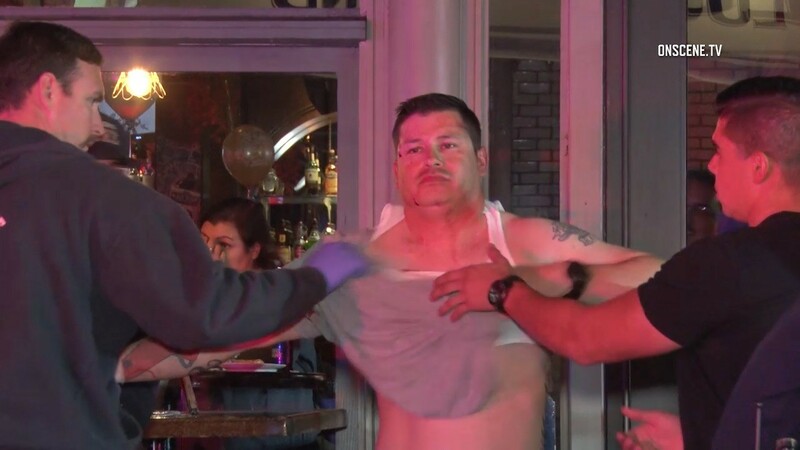 The argument between the 30-year-old victim and 42-year-old suspect Marc Dominguez began about 11:40 p.m. Thursday at a bar in the 600 block of Fifth Avenue, San Diego Police Officer Robert Heims said. “The argument turned physical and the suspect cut the victim several times with a knife,” Heims said. Police identified Dominguez as the suspect and arrested him on suspicion of assault with a deadly weapon, Heims said. Jail records showed he was booked into the San Diego Central Jail just before 3 a.m. Friday and was being held on $30,000 bail, with arraignment set for next Wednesday. The unidentified victim was taken to a hospital with injuries that were not expected to be life-threatening, Heims said.